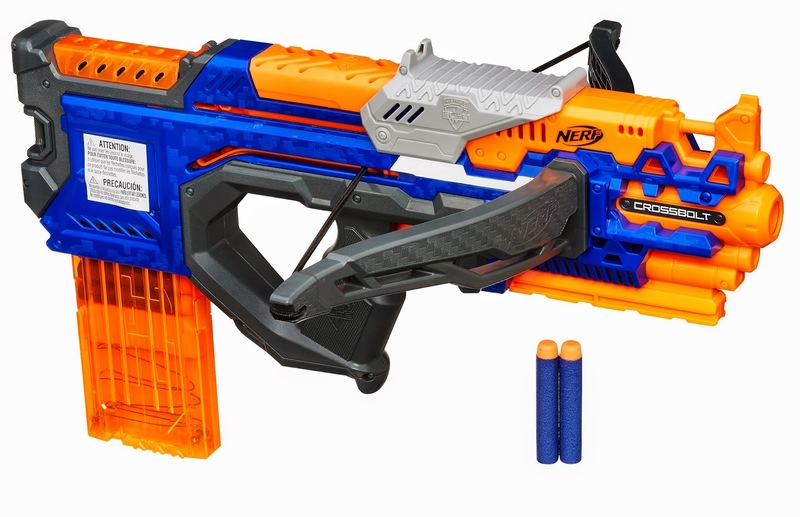 With many of the 2015 blasters already hitting shelves, there is still very little information on the one blaster that has created the most discussion, The NERF Elite Crossbolt. Well, thanks to a video posted on the Smyth's Toys YouTube channel, we can now see a firing demo of this little beauty. Ever since images of it first appeared online, the community has been rife with speculation, primarily about how this blaster fires. Some said springer, some said flywheels but many were adamant that it will be bow powered, propelling darts using the potential energy stored in the arms/string. Well the wait is nearly over but hopefully some of your questions can be answered right now. Smyth's Toys, one of the UK's leading toy retailers, have posted a firing video on their YouTube channel. The video, apparently from Hasbro, shows the blaster being loaded and fired by a gentleman with no head. Obviously we won't know for sure until some lucky bugger actually gets hands on with one but it does look like this sucker will be bow powered. What do you think? Thanks for Darren for the heads up. I'm loosing count of how many I owe you now buddy. Completely missed this earlier but Smyth's also have a release date on their website, 10th March for UK customers. The question is, will you be buying one? I wish more information could've been revealed, but now we have details on functionality. We're positive there is only one jam-door. I hope there's slam-fire as well. Actually, from the images on Smyths site, there are two jam doors. One at the back for darts popping out of the magazine and one above the pistol grip (where the dart moves forward to when you prime the blaster).